Home of Sarah Wheeler at 114 South 2250 West, Slaterville. The Slaterville Post Office was located in this room; a wall of cubby holes was built on one side; photos Feb. 2011. Wheeler Farm known as “The Island” in the nineteenth century; photo 2007. Old channels of Mill Creek surrounded the Wheeler farm giving name to “The Island”. John Wheeler and Sarah Stone were both born in England in 1834 and 1846 respectively, met in the Bingham Fort District and married in Plain City, Utah, in 1864. 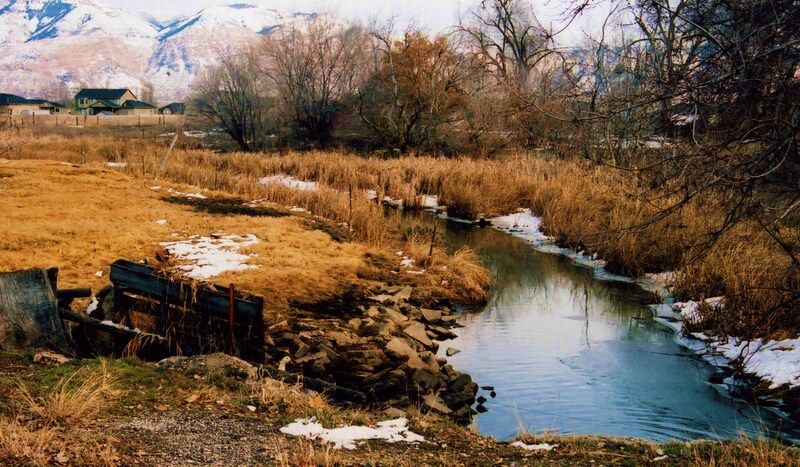 John and Sarah had a farm in Slaterville located on 2250 West next to Mill Creek; an old channel of Mill Creek surrounded the farm by water thereby giving the farm its name, “The Island”. The Wheelers had nine children. In 1886 when their youngest child was three years old, Sarah had a terrific shock when her husband died. He had acquired the disease of Black Erysipelas while shearing sheep. The rash started on the bridge of his nose and spread very rapidly to his brain. In less than three hours he died in her arms. Sarah worked night and day to pay the debts, save her farm and build the brick home above. In 1888 she was appointed post-mistress of the fourth class post office of the community of Slaterville. She held this position until the daily rural delivery mail route system began direct from the Ogden City Post Office. 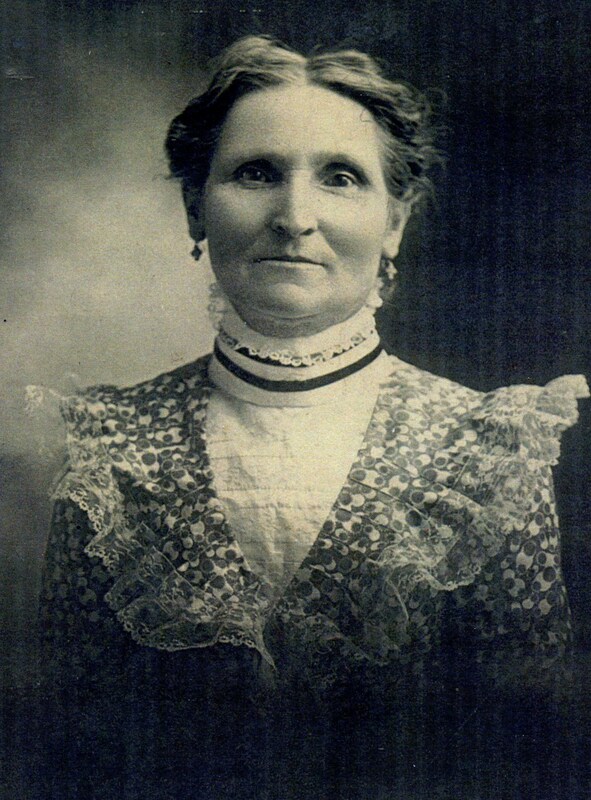 Sarah Wheeler, post mistress for Slaterville 1886. In her later years she sold her home and farm to her son Moroni Wheeler and moved to smaller home at 615 7th Street in Ogden, living with her daughter Lottie and next door to her daughter Flora W. Stokes. She died in 1916 at age 74. Statement Wes Spencer, Janruary 2010. Flora Wheeler Stokes, A Biography of Sarah Ellen Stone Wheeler, A Pioneer of 1853, manuscript, p. 1-4. This entry was posted on June 5, 2010 at 7:08 pm	and is filed under 4. 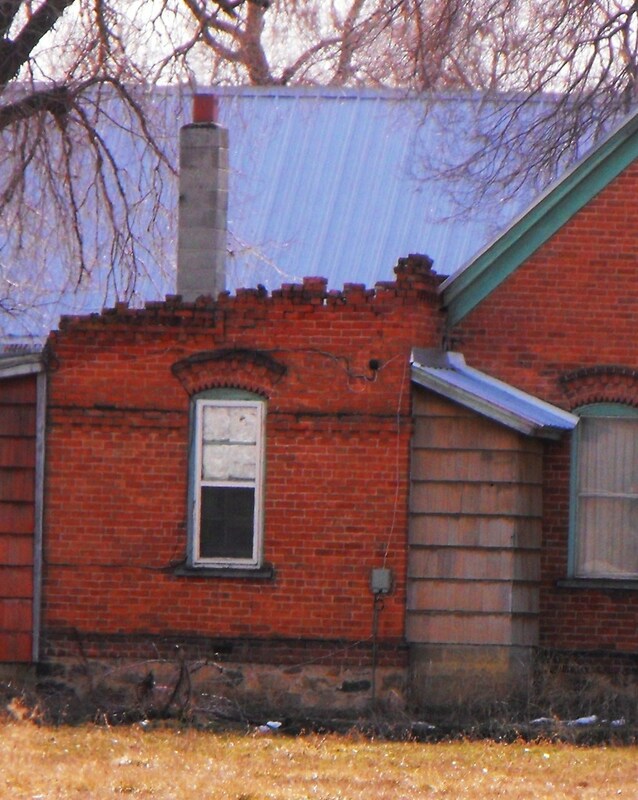 MORE HISTORIC HOUSES, c. 114 S. 2250 W.. You can follow any responses to this entry through the RSS 2.0 feed. You can leave a response, or trackback from your own site.